The perfect blend of role-playing game, card game and cooperative gameplay. Experience all this and more! You are an adventurer. Along with your fellow party members you will travel to locations, find treasures, allies and monsters! Use your abilities and items wisely and coordinate your efforts with your fellow party members to defeat the Villain before time runs out. Hold it! This sounds like a role-playing game, right? Not quite an RPG, not quite a deck-builder, definitely cooperative (most of the time), the Pathfinder Adventure Card Game allows players to experience an archetypal fantasy adventure in a refreshing new way. Note: Set up for the game varies depending upon whether you are playing a Scenario, an Adventure or a full Adventure Path. In addition, all of the cards will need to be sorted and placed in their respective compartments in the box. The set up below assumes this is the players’ first time playing. After initial plays, set up will vary based on where the players are in their adventure path. The first step is to choose the characters you and your fellow adventurers will be playing. Take the Character card and its Token card and place them in front of you. Then take a look at the card types and number that will make up that character’s starting deck. (There are deck suggestions for new players), and build your character’s deck using this list. Shuffle your deck and place it nearby. Choose a Scenario card and place it face up on the table. The Scenario card lists the type and number of locations (based on the number of players) that will make up the adventure. It also gives the players their goal to achieve victory! (Usually by facing a nasty villain!) Take the Locations listed and place them in the middle of the table with some space between. Location cards list the card types that will make up the cards encountered at that location. Randomly deal the number of cards listed into a face down stack and set it aside for a moment. Check back on the Scenario card and find the Villain and Henchmen listed there, go grab them from the box and deal a number of henchmen equal to the number of locations you have. Place one of each henchman (including the big bad villain) onto each Location deck then shuffle each. You have just created the encounters for each location! Randomly deal out 30 cards from the Blessing deck and place them face down. This forms the timing mechanism for the adventure. Now, each player places their character Token card at any location. More than one character can start at the same location if you wish. Players then check their Character card and draw cards to form their starting hand equal to their hand size. Check that character’s Favored Card Type. If you didn’t get at least one of that type card, re-shuffle and redraw until you do. Decide who goes first, grab the dice and prepare for adventure! Each player’s turn consists of five steps that are performed in order. Once completed, play passes to the next character clockwise. 1. Advance the Blessings Deck – Draw the top card from the Blessings Deck and place it face up in a discard pile. If at any time you must flip one of the Blessing cards and you cannot, the game ends and the players have lost the scenario. 2. Give a Card – You may give one card from your hand to another character at your location. 3. Move – You may move your character token from its current location to any other location. A Boon is something cool: a Weapon, Spell, Armor, Ally, Item or a Blessing. When revealed, the character may attempt to acquire it by “attempting a check.” (See below) If unsuccessful, the card will be “Banished” or returned to the game box for the rest of the scenario. If the check is successful, the card is immediately added to the player’s hand of cards. A Bane is something not cool: Villains, Henchmen, Monsters and Barriers. These will have to be overcome, and of course in the case of the Villain and his Henchmen, are the main focus for success in the adventure. Defeating a Bane banishes that card. However, failing to defeat a Bane results in dire consequences – usually taking damage. Damage is taken by discarding cards from a player’s hand. 5. Reset your Hand – A player may discard any number of cards, or must discard them if they exceed their character’s hand size. Then the player draws up to their starting hand size. If at any time a player must draw from their draw deck and are unable to draw up to their hand size, their character has died. That player may no longer play in the scenario. Determine the Difficulty of the check: Look at the skill and number listed in the circle in the upper-right of the card encountered. This is the Difficulty of the check. You will have to roll equal to or higher than this number to be successful. Play cards: All players may have a chance to play no more than one card of any type to affect the roll. This may add another skill die, or add another die of a different type. Take these dice in hand as well. Use Powers: Your character may have Powers that can affect a check. Just read what effect the Power has and apply it. Roll em! Roll all of the dice you have assembled to make the check. If your roll is equal to or higher than the difficulty, you succeed. If it is lower you fail the check. The primary component of the game is of course cards. Compared to many other card games out there the card template is not striking and the artwork is very familiar to those who play Pathfinder RPG. All that said, the cards are extremely functional in providing a catalyst to amazing story telling. The art is very good, the flavor text is excellent and the card stock is resilient. The HUGE box (see below) is huge for a reason. Besides storing the 18 different card types there is space to store players’ Character decks between adventures and special slots for upcoming Adventure decks. Moderate. If you are a gamer that has never played an RPG, skill checks and the idea of an adventure campaign setting may not come easy. Especially when manipulating the cards during gameplay (See Final Thoughts). For those who have played RPGs, the mechanics will be second nature. However, the adventures will still prove to be a difficult test of cooperation and hand management. This game can provide an amazing story driven adventure to a family game night with older children. Being cooperative (like most RPGs) older players can help the younger. Note that the game does require a lot of reading. This game is not recommended to a party atmosphere. However it is as close to a “social experience” as an adventure driven card game can get. If you view an RPG game session as a social experience, then this game will satisfy that itch. Each adventure path and scenario has random elements to be sure, but each is crafted to include specific cards of a certain type. It is up to the players to use a strategy based on their characters’ strengths to achieve victory. This is a great, although not pure, strategy game. Grab a character card, assemble a deck, go on an adventure and put it away. Whether you dive in deep and play forever or just every now and then, this is a great game for Casual gamers. This game is an amazing combination of tactical and strategic card play, role-playing elements, dice-building and upgradeable character cards that can be saved between adventures. It ticks every single Avid gamer’s box. Everything is on the cards. The two-sided Character cards list all the dice types needed for the skill checks, all character class restrictions (your character’s deck list), powers and so forth. The items, weapons and armor provide various levels of effectiveness based on how you use them. (see below) The Scenario cards list the locations, Villains and henchmen and rewards for success. The Monsters list special abilities and effects and of course the difficulty in defeating them. So after set up, the game matrix kicks in and allows reasonably free movement and options to explore the landscape of the adventure. It’s an epic adventure with a plot. There are very few plot or scenario based card games out there. The recent popular trend in “story telling” games either is minimalistic like Once Upon a Time or may require many more components and features such as the excellent game Mice and Mystics. Here you have a non-deck building, non-collectible, non… board game… card game experience that weaves a very specific tale: recreating the Rise of the Runelords story line from the Pathfinder RPG series. The game challenges you to be a part of the tale and create your own chapters and experiences within it. The card play is groundbreaking. Some of the best game designs include multi-use cards. Here, that mechanic is taken to a new height and is the most innovative aspect of the game. Each player’s deck is their health. This is not new by any means, however the starting deck size for all the basic characters is 15. This minimal amount of cards is ingeniously balanced with the multiple uses for those cards. They are: Reveal, Display, Discard, Recharge, Bury and Banish. “Revealing” a card simply means show it, use its effect and it goes back in your hand. Recharging a card allows you to use its effect and place it on the bottom of your draw pile. (adding to your Health.) In these two instances the card may be used again. For a greater card effect you can Display, Discard, Bury or Banish a card. You lose it (and it counts against your health) but the gameplay effect is much more devastating. With these different forms of card activations come the kinds of tough gameplay choices that make the game a challenge. This is a game that typifies our hobby. It is the very best of what a game can offer: a solid fantasy theme experience, with excellent strategic options, great replay value (even with the base set alone), easy to learn mechanics with diverse gameplay effects, cooperative decision making, some fun dice rolling, rewards and leveling, treasures, monsters, combat and exploration. Whew! Most of all, you have an amazing immersive experience. The game is especially immersive because you carry the game with you between sessions. By saving your character deck, you prepare for the next stage or game experience, ramping up the anticipation for the next game! If you are like most hobby gamers, this means that you’ll think and talk about the game even when you are not playing. That’s the mark of an excellent game. Just take a look at the last page of the rules and see the extraordinary number of people that had their hands in the creation of the game. Clearly this is a game that has had many talented people’s hopes and passions infused into it. Most of all, you never feel like you are playing a set of mechanics. The game is triumphantly elegant. There is a treasure trove of replay value in this box. Yes, it will require and investment if you chose to dive in head first: new Adventure decks will be released every month. But that’s what this hobby is about… right? Our advice, drop most of those other silly deck builders and begin a card game journey that will leave you recounting tales of your adventures for years to come. What more can any gamer ask? Enter a world of adventure with the Pathfinder Adventure Card Game, a cooperative game for 1 to 4 players. Each player has a unique character composed of a deck of cards and a set of stats. Roleplayers will find the stats very familiar—characters have classes such as fighter, wizard, and rogue, as well as numbers that define strength, dexterity, intelligence, etc. You'll improve your character by acquiring new items, allies, spells, and weapons as you explore and overcome challenges; over time, you'll be able to customize your deck to better suit your own individual vision of your character. Your adventure begins with a Base Set containing nearly 500 cards, including the first chapter of an Adventure Path that offers your characters interesting locations to explore, monsters to fight, and villains to hunt down, as well as piles of weapons, spells, armor, loot, and everything you need to build you own unique character deck. A few weeks ago I took a trip to a nearby game store with my buddy, who had been describing “an RPG card game” that he’d heard a lot about. I suggested it was probably the Pathfinder Adventure Card Game and, once we arrived at the shop, he excitedly confirmed it. He then shelled out the MSRP for it, which made me cringe, and we headed back to his place to play. There were four of us for that first mid-week work night of play, which saw me digging through the rule book and online FAQs, laying out stacks and stacks of cards, and instructing the other players on the turn sequence. It was a lot to absorb. Once we felt comfortable with game play, we packed it up and planned for a 6-hour game day on Saturday to play through the first official adventure, “Burnt Offerings”. With background narrative firmly in place, on to the review. While the details are below, I’ll go into my overall summary and feelings on the game first. Touted as a great stand-in for an RPG and a wonderful story experience, I am sad to say I simply did not get that vibe from this game. Each adventure is made up of multiple scenarios, and each scenario has a paragraph or so of story flavor text on its back. There is also an overall adventure story on the main adventure card. If you’re looking for a deep plot and an exciting story about the various encounters other than “you explore the Throne Room and encounter a horde of Ancient Skeleton Henchmen,” then you’re out of luck unless you’re the type of gaming group that adds narrative and flavor text on your own. That said, the mechanics are incredible: a system of modified die rolls and target numbers, supplemented or hindered by cards. For deck-building enthusiasts this must be Nirvana, acquiring new, more powerful cards during play and tweaking your character’s deck of abilities for optimal play from scenario to scenario. As a story and theme-driven gamer, I was hard-pressed to give this game a 7. It felt more like a 6. But the lady seemed to have a great time and had the opportunity to ask all sorts of questions about Paizo’s Pathfinder lore, which the already-initiated in the group were pleased to answer, and the team work involved and really interesting mechanics certainly bumped this up a rating. Every player gets a deck of cards to represent his character and abilities, drawn from several different types of cards such as Spells, Weapons, Armor, Items, Blessings, etc. These must be selected or located from multiple decks of cards during setup. The adventure itself is made up of a Blessings Deck (and discard pile) that doubles as a timer (you get 30 turns as a group, no matter how many players there are), and several Location Decks and their associated discard piles. Location decks, like characters, are made up of different types of cards that include benefits such as new treasure or spells, as well as monsters and other obstacles. Characters move from location to location and explore the Location decks via their plethora of cards. Burning through too many cards is not a great idea, as your deck of cards also counts as your health. You must draw up to your maximum hand size at the end of a turn and if you cannot draw a card, your character dies. A location is “closed” when a henchman is discovered within, defeated, and a specific challenge or condition is met for that particular location. A “boss” or villain card hides within one of the locations, escaping from that location to another for as long as other locations are open. Failing to defeat the boss allows him to flee and not only causes damage, but also removes rounds from the Blessings Deck timer. The art on the cards is lifted directly from the pages of Paizo’s line of Pathfinder books, typically from artist Wayne Reynolds. They are beautiful, but really the only component involved in this game. Very typical TCG-grade cards. You also get a set of dice. They are blue. If you’re looking for an RPG experience without a game master, or to weave an epic tale of swords and sorcery with a few friends, then no. Don’t even look at the price tag. To be quite honest, you should be playing an RPG if that’s your goal. But there are a lot of other games out there that put forth a bit more effort in the story that unfolds as you explore the world and do battle with the forces of evil. They just don’t always have sound mechanics. If you are looking for a game with an interesting challenge system and a new gameplay format unlike anything else you’ve played, and if you enjoy deck building, then you should absolutely buy it. You will love every moment from peeling open the individually-cellophane-wrapped decks and looking at the treasures hidden within, to choosing new feats and character abilities (such as a larger maximum hand size, extra bonuses to your die rolls, etc.) that improve your chances of success in higher-tier adventures. While I realize that my opinion is in the minority on this game and it has gotten ratings of 9 or 10 and “amazing” from most others, I encourage you to rate this review based on whether it contains useful information, and not the fact that you love it and I don’t. I find that often I have a very different view or opinion of a game than another reviewer, but that their information is sound and would definitely be helpful to someone else looking to purchase a game sight-unseen. I will always up-rate those reviews, because they give valuable insight to someone who is on the fence about a game they’ve heard about. I urge everyone else to do the same, and not down-vote reviews based purely on your objection to someone’s honest review of a game. I’ve played Pathfinder several times since receiving it for Christmas, and have generally found it to be a blast. The mechanics are compelling, and since the scenarios are relatively short, you can fit a play session into however much time you have. Since the review above explains the general mechanics, I’m going to limit the review to some notes I have on the game. –Great Diversity of Characters: There are seven characters in the base game, and four more added with the character add-on pack. Each character has a very different background and playstyle, as well as a good mix of gender and racial diversity. You should easily find one you enjoy playing. –Fun Gameplay: Gameplay is a tricky mix of using enough cards to explore before time runs up and win in combat, while not burning through so many cards you die. As you complete scenarios you’ll “level up” and become stronger, making for an even more engaging play experience. –Replayability: As you progress through the game your character will gain new abilities (and face new challenges) keeping gameplay fresh. If by chance you finish all the scenarios on one character, you can always play a new character for a very different gameplay experience. –Box Organization: The box is very well organized. Sometimes it’s the little things that really impress you. –Card Errors: This is what prevents me from giving the game a 10. There are several errors printed on the cards, causing us to go refer to the forums when something looks fishy. It’s an annoying waste of time. It would be nice if Paizo includes corrected base game cards with one of the future expansions. The Pathfinder Adventure Card Game attempts to recreate the feel of an RPG in card game format, thus eliminating the need for a DM or all that pesky role playing. It also promises to do the nigh impossible: incorporate a clear story into a card game. As someone who doesn’t enjoy tabletop RPGs (largely because of the necessity of finding a good DM or dealing with a bad one and the idea of seriously playing my character’s role) and someone who is a fan of card games (and being on the lookout for games that push what can be done within the limitations of a card game), this seemed like a perfect match for me. After numerous plays with groups of various sizes (and solo), I can say it is fun, but some flaws in gameplay and production keep it from being the revolution in card games it claims to be. Setup can take a while. For the first play, you have to sort the cards by type and put them into the appropriate slots in the box insert. Thankfully, there’s a diagram in the rulebook that shows where everything should go, and they’re largely already grouped together by type. After that, it’s on to the rules. For RPGers, a lot of this is probably going to be intuitive. Much of it was pretty intuitive for me, and I’m not an RPG player. Simply from having played a lot of video game RPGs (particularly a lot of the older BioWare games) I was familiar enough with the idea of succeeding at checks and such. Given how little that experience adds to it, I feel confident that even people who have no experience with the concept will grasp it pretty easily (after all, it’s essentially just seeing if your dice roll totals at least a certain number). Honestly, the game as a whole it pretty simple in theory, but the rulebook is significantly flawed. There is a pretty impressively sized FAQ already on Paizo’s website to clarify things that they did a **** job of explaining, and even to add sections that they forgot to include, apparently. Basically, you’ve got your work cut out for you to wade through not just the rulebook but also the FAQ and to make sure you have it all down. From there, you have to choose your characters and assemble your starting decks. But don’t be fooled into thinking that the suggested starting decks in the rulebook are actually what you should start with. Those have been errated in the FAQ, because some of them aren’t valid starting decks and there are certain combinations of characters that would require more copies of certain cards than they give you. Once you’ve consulted the interwebs to put your character together, you have to choose your adventure, find the locations you need for it, and assemble the location decks for each location. Each location tells you how many of each card type you need, which is nice, but it also requires you to shuffle the item, weapon, armor, spell, boon, barrier, monster, and ally decks so that you can randomly deal the right number of cards, which can take some time. Once that’s done, you make a deck of 30 random blessings as your “Blessings deck” (duh) that will serve to keep track of your number of turns. Got all that? Good, ’cause now it’s time to actually play. In a nutshell, you are trying to find and defeat the boss of the scenario. You start your turn by advancing the blessings deck, then you can give a card to another player at your location, then change locations, explore, and reset your hand. Each location has different effects and different deck composition, so matching character strengths to locations can be important. To explore, you just flip the top card of a location deck and encounter it by attempting the check listed on it. If it’s equipment, a spell, an item, or an ally, you acquire it and add it to your hand by passing the check. If you fail the check, it goes back to the box. If it’s a monster or a barrier, you have to pass the check to defeat it. If you defeat it, it gets sent to the box. If you don’t, you take damage (or other effect from some barriers), and shuffle it back into the location deck. There are also henchmen and a boss. If you beat a henchman, you can attempt to close the location (each has a different requirement to close it), but otherwise you can’t close it until all cards are gone from the location deck. Closing locations is important, as if you encounter the boss, he will escape to an open location, even if he’s defeated. If the boss is defeated and has nowhere to escape to, everybody wins and gets the benefit listed on the scenario card. Sometimes it’s acquiring an item, but on more difficult scenarios, your character gains a new skill. This is how the game replicates leveling up. If the blessings deck runs out, everyone fails, but gets to keep anything they’ve acquired. If a player must draw a card but has none left to draw, his/her character dies. At the end of each scenario, players have to reset their decks. Each character’s card has a certain number of each card type that can be in their deck. You can choose any of the cards you have of that type to make up that number. You’ll pretty quickly replace the starting equipment in your decks with things you’ve acquired through exploration. Players can also trade cards freely with other members of the party at this point. Once the decks are set, you either start the next scenario or put your character decks in the handy slots in the insert to keep them together for next time. The one area that really makes this game stand out is in the variety of ways you can play the cards. You can “reveal” a card (show it from your hand), “discard” it (exactly what it sounds like), “recharge” it (put it on the bottom of your deck), “bury” it (remove it from the game until the end of the scenario), or “banish” it (remove it from your deck permanently and put it back in the box). The effects these achieve get increasingly powerful based on what happens to the card. For instance, you can reveal a weapon to add a d8 to your combat check, or you can discard it to add the d8 and a d6 to the check. For anyone who is at all familiar with gaming, this should be a pretty easy game to learn. For people who aren’t familiar with gaming, it might take a couple of games to understand and remember everything, but it’s relatively simple. The learning curve is upped significantly, though, if you rely on the rulebook for your first games and then discover the FAQ. There are a lot of things that you’ll be doing wrong, even while following what it says in the rulebook, just because the rulebook isn’t always as helpful as it should be. Some things get glossed over, while others simply needed clarification to properly explain what needs to be done. The components are a real mixed bag. The box insert is great, as it keeps things separated and reduces setup time. Just don’t let the box get tipped on its side, or you’ll be sorting everything all over again. The dice are also roll well and aren’t too bouncy. The card art for the character cards, barriers, and spells all look good too. From there, things start to go downhill. The art for the other cards is something of a mixed bag (some of the monsters look good, for instance), with most of it being incredibly basic. You’ll probably find yourself thinking, “Yep. That’s a sword,” or “That sure is a skeleton.” It’s not that it’s bad, it’s just very expected, unexciting art. The cards feel good, but they start to get scuffed after a handful of plays. You could sleeve them, certainly, but then everything wouldn’t fit in the insert by the end of the campaign. I also had a card in my base set that was already incredibly damaged on the back when I opened it (the art on the back was largely torn off). It seems that this isn’t terribly uncommon based on forum posts. [As a side note, Paizo’s customer service was polite enough, but it took them two weeks to get back to me about the issue, and another three weeks for me to get the replacement card in the mail.] The coloration on the cards is also incredibly inconsistent. Some have very heavy black outlines around the logo and characters on the card backs, while others the black is virtually non-existent. The coloration is also very dark on some and very vibrant on others. There seems to be no rhyme or reason to the changes. Finally, there is a lot of errata, both for the cards and the rulebook. Sometimes it is simply because of sloppy proofreading (for instance, Detect Magic says you must pass an Arcane 14 check to recharge it, but it should say Arcane 4, and other cards are missing card types or have some they shouldn’t have), but others are missing important rules text. Blessing of the Gods, for instance, says yo ucan treat it as a copy of the top card of the blessings deck, but fails to mention that it doesn’t gain the recharge ability of those cards, which is a pretty important distinction. The basic gameplay can be quite fun. The diverse card playing mechanics are a breath of fresh air, and the persistent characters who level up over time is also a great addition to the idea of co-op card games. For all the talk of story, though, it’s virtually non-existent, or at least not more prominent than other similarly themed card games (such as Lord of the Rings: the Card Game). The story basically boils down to general, vague ideas (we’re finding the person who is poisoning people in this town, we’re hunting goblins who attacked a town, we’re fighting this dragon that’s been terrorizing a town, etc.). It certainly isn’t the narrative-heavy, story-driven experience Paizo implies it is. That’s not necessarily bad, as it doesn’t really affect the gameplay, but if you’re coming for a strong story, you’ll be disappointed. You’ll also be disappointed if you’re expecting a deeply co-op experience. While there are some benefits to being at the same location, and a few characters have abilities that help others at the same location, it’s often a better strategy to spread out. As such, most of the cooperation comes from playing cards to help out other party members and sharing loot at the end of the scenario. Being an experience player with both Role playing game and Card Games I was very curious to try Pathfinder Adventure Card Game. Being used to heavy rule booklets, I was pleasantly surprise to see that the rule manual for Pathfinder was short and sweet. It is pretty well written and clear enough to give you a good understanding of how the game is going to play out. The set up of the game is also simple. It does take a bit of time to do your first setup but once you get the hang of it, it becomes simple pretty quickly. The game play itself is also pretty simple. What made me fall for this game right away is really the excellent mix of the role playing and team action involve as well as the complexity of managing you deck of cards. 1- Role playing aspect: You find here several core elements of a good role playing game. First you have the character aspect. Without being to complex, it does give you the ability to evolve and level your character as you play and advance in the adventure. The different classes available for play are also distinct enough to give a good feel of what your role and responsibility will be during the game. The game is also balance enough to not limit any of the character to be just what the class would indicate. So for example, even if you are playing a cleric, you can do a lot more that just healing and provide bonuses to the other players. The second aspect of the role playing that is there for me is the interaction between the players during the game play. Pathfinder is a co-operative game and communication amongst the players is very important if you are to succeed with the quests. Whether it be trading items to make other character more powerful or teaming up to explore dungeons, if you are willing the game as the potential to unlock some very good role playing for the adept. 2- Cards Aspect: as you would think, the Cards play a major role in this game. When you play your first game and follow the manual to build your character deck, you will quickly realize that there is a lot of potential here. Indeed, as you become more familiar with the game you will get the opportunity to build your own character deck (bear in mind that you still have to follow some character guidelines). Your deck of cards is also very important, if you ever run out of card to draw, it means that your character dies. Hence the strategic approach to the game. It will define how you play your character. Overall, a very good game that nicely brings together two very popular type of game. The balance between the two elements is in my opinion the strong point of the game. The only week point in my view is campaign mode versus the single game. The campaign mode will allow you lots of possibilities and create good flow for game progression. On the other hand, if you are looking to play a quick game with friends, you might find that you are limited to the first few scenarios. Although there is a good replay value, the game really takes on its full meaning when you evolve the characters. I have never played a tabletop RPG before. It has interested me, but the time commitment and being able to meet with a group of friends would be difficult (plus my friends would be harder to convince to play a tabletop RPG). So when I saw this game, I thought it would be a great RPG-like experience to play with my wife. (that was her first comment after we played our first scenario). These are just my opinion, and it may change. But at this point, my wife and I are enjoying this game a lot. I can guarantee that we plan on getting the next adventure path (Skull and Shackles) once it comes out late summer. 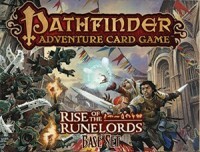 I just got through with my first game of the Pathfinder Adventure Card Game: Rise of the Runelords (and isn’t that a mouthful of a title) and I’ve been trying to put my finger on exactly what I liked about this game. On the one hand, this is sort of a deck builder game. But the deck building is pretty light overall. You’re going to start with either a deck of cards predetermined by your class (assuming you go with the recommended build) or you’re going to build your deck from a small list of cards that you can choose from to begin with. It’s not a large deck and during the course of your first adventure it isn’t likely to change dramatically. On the other hand, this is a “rpg in a box” style game. That is, it presents a way to do some RPG-style adventures in a way that’s a lot easier to complete than actually playing a roleplaying game. But the problem is that there’s no real roleplaying built into the rules so if you’re going to be playing it in this way you’re going to have to bring a lot to the party yourself. On paper this doesn’t sound like a particularly interesting game. Choose a location, reveal a card, deal with the card with your cards. Look for villain, close locations until villain has no place left to run. Sounds like advanced Munchkin. Yet somehow this all seemed to gel for us. There’s is something that’s hard to put my finger on when I think about why I like this game and I can completely understand people who don’t enjoy it. It’s definitely one of those games that needs the right group. I don’t think that I would enjoy playing it solo. Even so, I really look forward to my future adventures! I have never found myself so conflicted by a game as I am about Pathfinder the Adventure Card Game. It is heavily flawed, the rule book is a mess, there are not enough options or diversity and it is bloody expensive. Yet for all of this it can be vastly immersive, engaging, interactive, and in the end left me desperately wanting more. The game is a co-operative deck building game. Each player chooses one of 7 character decks to begin the game with, each deck consisting of 15 cards. This deck constitutes your “life”, if you ever run out of cards in your draw pile you die and permanently lose your character. Permanent being a key word here, because one of the strengths of this game is its “building” mechanic. The game consists of “exploring” various locations as a team hunting for a target that you’ve been commissioned to eliminate. As you explore you will come across additional weapons, tools and allies that you will want to add to your hand and ultimately your deck. This is significant because as each round of the game winds down, you will get to reconstruct your deck from the cards that you’ve encountered through your journeys. You are building a persistent character deck that can be used in all future games. The cards and characters are beautifully put together and very interesting. I have certainly seen better, but the cards are nothing to be ashamed of. Their short background stories provide a colour backdrop to draw you in and the items do very different things and creating interesting texture and strategic combinations. I do take exception to the relatively few number of character options available in such a large and expensive game; especially when considering that a four character add-on is readily available for an additional $20; but even this add-on doesn’t provide enough gender, racial and class diversity to address player interests. Additionally a few easy inclusions would easily give the game a better “bang for your buck” factor (ex. miniatures for the characters rather than cards). But in addition to the poor layout of the rules, there is the frustrating inconsistency of the narrative. To be fair this is only a problem because the game is so **** good at drawing you in. However, once it does draw you in, it slaps you in the face with so many ridiculous and arbitrary situations owing to the random construction of the location decks. The location decks are constructed from a set list of card types where you are supposed to randomly pick the number of cards of a certain type to add to that location deck. The mystery this adds to the decks is great, the sometimes downright drug-trips that result are not. For example you might head into town to investigate some rumours about bandits being involved in the operation of the general store. You investigate, open a closet and discover a hill giant… in the closet. Or better yet, a massive aquatic Bunyip which bites your head off. While hilarious, the game is not painted as a comedy and the experience is jarring to say the least. Now this is not to say that I didn’t like the game. The game is in fact amazing. The problem solving, sharing and persistent engine building are absolutely fantastic. The game plays on a massive amount of chance (with dice) but allows you to manage your chance using cards and abilities. The narrative elements are truly engaging and interesting. But the entire game feels as though it should have been heavily edited, brushed and combed by someone outside the development team before being released to the wilds. That being said, there are many things being done tame the game and to alleviate the problems of this game by both by Paizo and the community. Certain house rules regarding monster types have been proposed regarding populating location decks, gorgeous play mats are available at BGG that simplify and explain the character skills, new and interesting scenarios are being proposed and created in the forums. As much as the problems in this game are infuriating, they are not game-breaking and the game is VERY GOOD. So in the end I am left angry at the unpolished product I have in my hands, annoyed with the extra work and rules needed to iron out oddities in the game, but also exasperated that I don’t have MORE in my box and irritated that I am almost definitely going to buy most of the expansions – because it’s just that much **** fun. Unless you are living under a rock you have seen or at least heard of the Pathfinder Adventure Card Game by now. This review will help you get a better understanding of just what you’re getting into if you plan on picking up a copy of the Pathfinder ACG. Lets start by answering your first question, what is an Adventure Card Game? Well I am not entirely sure anyone can easily describe that, the description I liked best reading board game geek was a “deck leveling game” that does pretty well, but in my head it reminds me of deck building games where you are free to acquire cards and construct your deck as you please, this is not the case with Pathfinder ACG. Think of it as an Dungeon Crawl in a card game format, sort of a mashup of Descent and Arkham Horror, but borrows a fair amount from the Living Card Games. The essence of the game is that you and your groups’ decks (characters) will level up and get stronger (better / more cards and bonus feats / traits) as you successfully complete scenarios. Your deck will serve as your hit points as well as your means to success. In each Scenario your party’s goal is to defeat a Villain, the trouble is you are not quite sure which Location he is hiding at, and to make things worse he will just run away from a fight as long as he has somewhere (a Location) to escape to. That means it is your job to lock down these Locations so you can corner the Villain, to accomplish this you will need to defeat his Henchmen at each Location and then pass a Check corresponding with said location. But it isn’t that easy, your adventure is only blessed for so long, and after 30 turns (tracked via the Blessings Deck) your party will fail and your adventure will come to an end. My Thoughts: Well, I will be honest my first couple plays we probably made more than a few errors, and I did not enjoy the game at all. However after reading many great reviews and spending the cash on the game I decided I wanted to give it more of a chance, I am very glad I did. It wasn’t until I tried my 3rd character that I really ‘enjoyed’ the game, before that I felt kind of like a car salesmen trying to hook my friends on it in hopes that the game got better as we learned the rules and more adventure decks are released. I found that I did not enjoy the recommended decks for any of the characters I tried and that was the verdict from the rest of my gaming group, there were some that only needed slight tweaks and then some that felt way off. Since I started playing as Lem I have felt much more involved in the game and that is probably my biggest point to stress about the Pathfinder ACG, the more involved you are the more fun it is. I will delve a bit into my thoughts on each character below. Regardless of who you choose to play as you can easily keep track of your deck and progress through the scenarios by using this excellent spreadsheet found on bgg. http://boardgamegeek.com/filepage/94190/pathfinder-acg-character-tracker-spreadsheet Finally I would like to add that I love how well this game scales, probably better than any other game I have played. I enjoyed the solo play a lot more than I thought I would and we have played with every number of players from 2-6, excellent with any number and 1-6 is an odd number for a cooperative game which I think it handles the too easy or too hard problem better than other cooperative games. Lem: Lem has a lot of options for customization, you can make him very offensive so that he can explore and handle almost any situation on his own, he can help other characters in the same location as him, he can be a very effective healer by using cure and his passive ability of changing cards in his hand with his discard. What I like most about Lem is the speed at which he churns through his deck, recharging cards to assist other players and still having the resources left on your turn to handle an exploration is awesome and can be done almost every turn with Lem. The cards I used in Lem’s starting deck are a little different than the recommended cards. I used these cards to help with Lem’s weakest checks so he is more effective at solo play and exploring on his turn, while still being able to aid his friends. If anyone is curious the first feats of each type I selected were Another Spell Card, Charisma +1 and +1 to aiding other characters. If you are someone who has been on the fence about Pathfinder after trying it, try the first adventure deck. It adds some much needed variety. I think the ‘weapons’ additions were boring to say the least but the Barriers, Monsters, Villains, and especially Henchmen were all done exceptionally well. The Pit of Malfeshnekor is very cool, it gives you the option to take a free item but at the expense of damage and I was wondering where the Fiery Weapon was in the base set. The new blessing is much needed, it adds bonus to combat checks against monsters. The henchmen have some variety in the adventure pack with most scenarios hosting more than just a generic type of henchmen. I saw this game released at Gen Con and it was my brother who was more excited about it than I was. He bought a copy at our local game store but never played it. He eventually sold it to my husband and I. After playing it for the first time I was floored. This game is really good! Several more play throughs later and I fall more in love with this game each time. The setup is a bit tricky for the first few games but it gets easier as you get used to it. You have to first choose your quest and then find all the locations, villains, and henchmen that go along with the chosen quest. Then for each location there are numbers for each type of card and that’s how many go in that deck. Ex. 2 Barriers= 2 random Barrier cards. The rulebook shows a fancy set up for laying the cards out but I find it unnecessary and just usually line them up in a row. The best part about the game is the co-op gameplay! However, you take individual turns but can play Blessings, Spells, etc. on each other to help out. On your turn you flip the top Blessing card. (There are 30 of them and they are basically a timer. You run out of Blessing cards in this deck and you lose.) Next you move your hero to one of the locations and flip the top card. Then you encounter the flipped card. This can be a fight, acquiring items, armor, spells, etc., or fighting the villain. Finally you draw back up to your hand limit then it is the next person’s turn. The game ends when either all heroes have died, the villain has died, or the Blessing deck has ran out. This is a card game based upon a RPG after all so you can level up your heroes based upon the quest rewards. This can get you some awesome equipment or feats. This makes the game have that RPG feel. I can’t get enough of this game! It has so much going for it. I would highly recommend playing one hero all the way and custom his/her deck. This makes you feel like you are playing a RPG. There are times that you won’t win the quest and it is a shame to lose your hero after they died. However, we have a house rule that if everyone’s heroes die than we just restart the quest with the same heroes. This game is really fun with a lot of replayability. I never played the Pathfinder RPG but I really enjoy this game. I have been a fan of the Pathfinder property for years. When I saw this in development I was curious how they’d translate an RPG to a card game. Turns out the translation was both intuitive and well done. Mechanics: The mechanics of the game are excellent. Each scenario details how to build the locations, which are basically decks the players will explore. Each player controls a character who in turn has their own deck which represents the characters powers, equipment, and health. The ingenious part is that though common rules govern how the characters play each character is different enough to create diverse play. For instance the Fighter plays very differently from the Sorcerer, and each is very evocative of the class represented. Components: The base game comes with a basic card pool, plus the first of 6 scenarios. This is enough for 4 players to play, but inevitably players will want more. The designers created a campaign for the game, and every two months (each month with later game) a new scenario is released to continue the story. In addition to that the also released a character add on deck, which expands the number of characters available as well as adding enough additional cards to allow two more players to participate. The card stock is admittedly a little flimsy, especially for a game that involves so much shuffling, but that hasn’t bothered me too much. Theme: The campaign is based around a previously released RPG campaign. If you’ve already played the campaign the story will naturally be familiar. Likewise, as you play the card game story elements of the RPG will be spoiled. AS far as the story itself it’s classic fantasy RPG tropes: Seek out treasures and monsters to defeat the big bad. Overall we’re fans of the game, and the fact that it’s designed for solo play only adds to the value of this otherwise excellent game. PAC has given my wife and I a fun alternative to rpgs. This is mainly due to the fact that Paizo has managed to capture the feel of a Pathfinder rpg adventure in a card game. As a veteran of over 3 decades of roleplaying, I had my doubts but PAC delivered. Each player has a character complete with starting class, race, powers and abilities that are familiar to any rpg gamer. Spells, weapons, armor and equipment are handled by the game’s deckbuilding component. Each character starts with a beginning deck, but as they complete adventures and challenges, additional card will be added, equipment upgraded, etc. The element of luck is present in the form of everyone’s favorite polyhedron dice. These dice are rolled when attempting to overcome a challenge (bane) or to claim a new card (a boon.) As in rpg’s the characters’ attributes and skills modify this roll as can equipment, spells, allies, and even the blessing of the gods. As a cooperative adventuring party, the players send their characters on scenarios along an Adventure path. Each scenario presents a number of location decks according to the number of players. Each location deck is comprised of monsters and barriers as well as cards of the aforementioned types. Each location is unique and has unique properties and decklists. There are five scenarios to an Adventure and six Adventures to the Adventure Path. There is infinite replayablitity and the ability to design your own adventure paths as well. Fridays are PAC nights at my house. Well I finally managed to sit down and play my first game of Pathfinder the Adventure Card game. The scenario I played was called Brigandoom. The is an introductory scenario, but it was quite enjoyable and one that I would play again with a different character. My character for this scenario was the Paladin (from the Character expansion pack) who felt it was her responsibility to track down a bandit leader who had been causing lots of trouble in the area. The Paladin is a great character to play when adventuring on your own. She has very good stats and certain abilities that can help you on your quest. She is also proficient with armor and weapons and has quite a few blessings of the God on her side. The longest part about the game was the setup, but even that was kind of minor considering the fun I had tracking down the bandit leader. Deciding which location to start at is important and a player should read the location cards (as well as all the other cards) carefully when making this decision. As I was playing a story kind of developed in my head about what my character was going through and the hardships she had to endure. Most of the encounters were pretty easy to overcome, but there were many. The villain was defeated on all occasions but always managed to elude me by escaping to another location to which I had not yet searched. Another wonderful thing about this game is that your character will or may not acquire various items, allies, spells.. along the way and these cards are added to your Character Deck for the next adventure, so in essence your character becomes stronger as he/she completes adventures. The game ended when the villain was finally cornered at the Waterfront and attempted to make a last ditch effort to avoid capture, but all to no avail. I won this game and was rewarded with a random item for my effort, but what does a Paladin do with a crowbar? The Gods work in mysterious ways and as such I should be grateful they have found me worthy of such an item. I look forward to more adventures with my stalwart Paladin as she journeys onward. Her shining armor and shield reflecting into the sun and her crowbar of justice firmly grasped in her hand ready to smite the evil that has been unleashed upon the land. The game is pretty solid. A great little rpg for those nights your GM has fallen behind or just needs to take a night off. Worth every bit of the play through. As for replayability I was left wanting. Once you have finished a base set and all of it’s added expansions there is no real reason to go back and play it again unless you just really needed to find out what playing as the rogue this time through is like. The game play doesn’t change and and all the locations and story it set.So this leaves you with the only option of re-upping into the next base set to really continue the enjoyment. That aside, like i said it’s absolutely worth a play through. It has solid GM free story telling, great game mechanics, each mission even though plays out like the one before it feels special and unique in its own way and most importantly it’s enjoyable by everyone at the table. If by the end of it you are ready to move on to the next game, it has done it’s job. Must have if you are a pen and paper table top fan. The rest may want to think about something else. I play the Pathfinder Card Game just about once a week. It’s surprisingly addicting. If you are a fan of roleplaying games but don’t have the time to devote to hours of gaming at a time, you should check this out. If you like deck building games, this also has a feel of deck building to it, only at a much slower pace. You are a group of adventurers on a quest to clear out monsters and villains from various locations, while also finding loot and leveling your character along the way. You can work together to fight monsters, or branch off on your own and take a risk. My gaming group tends to split up and fight off monsters before the Blessings deck (the timer for the game) runs out. Sometimes we do need to gather together to help each other meet checks, especially when adventures are specifically focused on one trait (such as Wisdom or Charisma). The Pathfinder Card Game can take a while to set up, but once you’ve gone through a few different sessions, the set up gets quicker. My advice is to play two sessions in one sitting so that there’s less set up involved. Learning the game is on the easier side, especially if you have someone who has played the game before to guide you through how to play. You’ll get the hang of it at least after two sessions. Once you’ve played through a few times, you’ll want to keep playing. There are several milestones you can reach with your character, and you never know what kind of loot you’re going to encounter on your adventures. I was a little wary of this game at first, because I wasn’t too keen on deck builders not to mention how effectively this game could deliver on creating persistent characters. Both of those concerns went away after the first play. It is a thrill to score a new, and sometimes just different (though occasionally slightly better) weapon or item or spell. I also appreciate the different skills each adventurer brings to the board…errr…table. Additionally, I find the Adventure Paths and their related Scenarios to be challenging and annoyingly stingy. Though I might not appreciate it in the moment; I like that I’m not leaving one Adventure or Scenario with tons of loot. Players need the right balance of might, magic, blessings, intelligence, wisdom, and luck. Lastly, there are often surprises around every temple pillar. Who knew you needed wisdom to best defeat those pesky Bunyips? I love this game. As a gamer who lives with non-gamers, this is a breath of fresh air. I do agree with a post by another player that it felt like an extended beta that I had to pay for to participate in; especially after reading the rules for the next box. I very much look forward to the next adventure path (Skulls and Shackles) because I feel as though they sorted out some of the mechanics issues. I really wanted to love this game, I love the pathfinder RPG and the card game system on paper sounded amazing. Differing levels of actions based on where the cards you use end up (i.e. recharging onto bottom of deck, banishing back into the box and out of the deck permanently, etc) sounded like there would be some interesting decision to be made, and of course there would be theme right? Well…after playing this 5 or 6 times, I can say that I honestly have no desire to ever play it again, and it will only happen if my group needs me to help finish a campaign. Even as a game you can just easily shoot the **** over, it fails. The theme? Completely non existent. Each scenario plays out EXACTLY the same as every other. The villains have some small differences in abilities, and there are different names of the locations you are visiting, but the game play is exactly the same, over and over again. There are no real interesting decisions to be made. Find a villain? Close the location. Wash, repeat. Most of the classes get to the point where most combat is meaningless and you will surely win, unless you will ***************** lose (which is rare). The upgrades are nice but really favor the melee classes, though there are some nice spells you can pick up. But even the feats and traits you can level up into never really give a sense of there being an organic character you are playing, it’s just a rote recipe repeating itself over and over. Like I said earlier, perhaps this will work for your group if you want something light you can play while throwing a few beers back and catching up with friends, but there are SO many games out there now to fit every conceivable need, that I just cannot recommend this one. This game sounds impressive. All reviews I’ve watched on Youtube are positive and exciting. I think this is mainly due to it being very new and not much actual playing going on yet. After playing a few scenarios (2/3 of the game as shipped), it became painfully obvious to me that the game lacks depth–big time. There are 500 cards but really not a whole lot of variation when you actually look at what is meaningful. If you play this game, you will understand. Scenarios are ‘different’ but they are really all the same–that’s not exaggeration either. There is really no story, only a descriptive paragraph or two on adventure, scenario, and location cards. It’s just bland and definitely lacking the ‘adventure’ portion of the title. The real kicker is that your success or failure is mainly determined by whether the Villain and Henchmen you are searching for in the ‘location’ decks are near the top or near the bottom. If too many are near the bottom, you will run out of turns and lose. If most are near the top, you will win absent some sort of act of God affecting your dice rolls. The concept sounds good and probably could be good, but this game doesn’t get there and I can’t imagine anyone wanting to finish this game much less replay or expand their game when the expansions are available, unless you like rote, unimaginative card turning and dice rolling and then maybe this is for you. I was frankly surprised at all the high ratings for this game after buying it (and going by those ratings in my decision to purchase it)and playing it. Perhaps boardgamers in general are very easy to impress or very hesitant to criticize. I firmly believe with time this game’s rating will drop like a rock to where it really belongs. If I could change my rating (haven’t figured out how to do that or if it is even possible on this site), I would definitely go with a 4 rather than the ‘kind’ 6 I gave it previously.